What Can We Do in Bideford? Wander along the riverfront to the ancient arched bridge. Explore the town’s narrow lanes or ‘drangs’. Pick up fresh produce at the Pannier Market. Have a pint of local ale in a historic pub. Take the family to the Big Sheep or the Milky Way. Spend a day on the Blue Flag sandy beach at Westward Ho! Swim or picnic at the secluded cove at Bucks Mills. Explore the pretty fishing village of Appledore. Cycle through the Devon countryside on the Tarka Trail. Visit the picturesque harbour at Clovelly. Book a surfing lesson at Croyde, Woolacombe or Saunton. Discover towering cliffs, rocky bays and shipwrecks on the rugged Hartland Peninsula. Play a round at the Royal North Devon Golf Club. Stroll through the magnificent grounds at Tapely country mansion. Delve into the town’s history at Bideford Railway Heritage Centre. Take the ferry from Bideford Quay to Lundy Island. Where Can We Stay in Bideford? Book a room at one of the town’s cosy guesthouses. Stay in a hotel such as Durant House or Royal Hotel. Pitch a tent at a campsite on the beach or in the countryside surrounding the town. Book a holiday cottage in Bideford, on the riverfront, in the town centre or on a hillside overlooking the estuary. 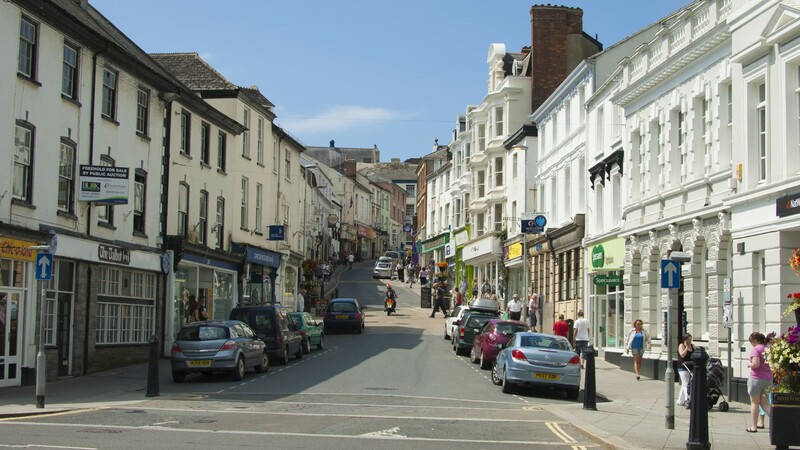 The historic port and market town of Bideford lies on the western banks of the River Torridge, a few miles from the North Devon coast. An arched, stone bridge dating back to 1535 crosses the river, connecting Bideford with its neighbour, East-the-Water. Author Charles Kingsley lived in Bideford and based his novel Westward Ho! in the area, describing it as a town of white houses – although today, many are pastel-coloured. In the town centre, narrow streets lined with independent shops lead to a graceful riverfront, where cafes, pubs and gardens provide views along the river to the estuary and the ocean beyond. The Quay bustles with the comings and goings of various boats, and there are regular ferries to Lundy Island, 22 miles offshore. Hidden away behind the Quay, narrow alleyways or ‘drangs’ are home to many of the region’s best antique shops. Bideford was once Britain’s third largest port and still has a thriving pannier market where excellent local produce is sold. The town is known for its graceful Victorian architecture and historic landmarks, such as the parish church of St Mary, which stands on the site of the original Saxon church. Bideford’s New Year’s Eve celebrations are legendary, when thousand of people in fancy dress gather at the Quay to watch the fireworks. Bideford is a stone’s throw from the spectacular North Devon coast. Westward Ho! is just down the road, a laid-back resort with a variety of seaside amusements, great places to eat and drink and a sandy beach where you can swim, surf, sunbathe and build sandcastles. Nearby, the Royal North Devon Golf Club is home to England’s oldest golf course, which is widely believed to be one of the country’s most challenging. Further west, the fishing village of Clovelly is not to be missed, with narrow cobbled lanes which descend to an ancient harbour. Nearby, Bucks Mills is a secluded village, where a steep, wooded valley overlooks a pebbly bay. Continue along the coast and you will reach the rugged Hartland Peninsula, home to a magnificent abbey, towering cliffs, shipwrecks and a historic quay. Appledore is another picturesque fishing village with ferries across the river to neighbouring Instow. The South West Coast Path covers the entire North Devon coast with breathtaking views across the Atlantic, towards Lundy Island. Self-catering holidays in Bideford are popular among families, with a range of activities for children nearby. The Big Sheep is a brilliant amusement farm park with sheep races and the Ewetopia playground, while the Milky Way has rollercoasters and rides for kids of all ages. The manor of Bideford is recorded in the Doomsday Book of 1086 as having been held by the Saxon nobleman Brictric for William the Conqueror, and later by the King’s Wife, Matilda of Flanders, when there were 30 villagers, 8 smallholders and 14 slaves in Bideford. In 1272, a charter was granted to Richard V de Grenville by Henry III and Bideford’s first council was created. The Grenvilles were lords of the manor of Bideford for many centuries and played a significant role in the town’s development. There is a monument with an effigy of Sir Thomas Grenville in St Mary’s Church. In 1646, 229 residents of Bideford were killed by the plague, which is believed to have been brought to the town by a Spanish vessel laden with wool which docked at the Quay. In 1830, it was reported that 5,000 people waved farewell to ships leaving Bideford for New York, St. Andrews, Newfoundland and Montreal. From 1840 to 1900, it is recorded that 2,467 emigrated from Bideford to Canada and 248 to the U.S on ships from Bideford. By the 16th century, Bideford had become one of the UK’s most important ports. Sir Walter Raleigh’s first shipment of tobacco arrived in the town, and several roads in the area were named after him. Bideford was involved in the Newfoundland cod trade from the 16th century to the 18th century, and in the transportation of indentured servants to the New World colonies. Many ships were built in the town but the industry declined towards the end of the 19th century, when the UK’s industrial cities started to construct steel steamships. How Do You Get to Bideford? Driving from the east or west, Bideford is approached on the A39, also known as the Atlantic Highway. The A386 runs from Torrington to Bideford, from the south. The town’s nearest train station is Barnstaple, 7 miles away, with regular trains to Exeter, where connections to the rest of the UK are available. Barnstaple Railway Station is a short drive, taxi ride or local bus ride away from Bideford. Exeter is the closest airport, approximately an hour and 15 minutes away by car, with flights to cities across the UK and Europe. Bristol Airport can be reached in approximately two hours, with flights to a wider range of cities. London is roughly four hours away by car.